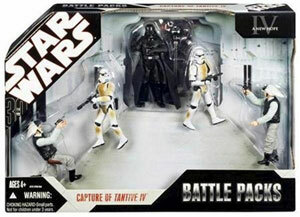 Description Of Item: The Capture of Tantive IV Battle Pack includes 5 unique 3 3/4-inch Star Wars Action Figures and accessories from the original film! Relive the capture of Princess Leia's ship with Darth Vader, two Stormtroopers, and two Rebel Troopers. Figures include blasters and IT-0 Interrogation Droid.